There’s something that has troubled me since childhood. In Charlie and the chocolate factory, one of the lucky children (Veruca Salt) gets her golden ticket thanks to her father repruposing his peanut shelling factory in a chocolate-bar-unwrapping factory. 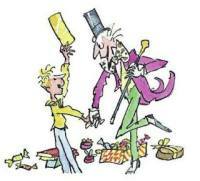 Now, there are only five golden tickets, and chocolate bars in the book seem quite popular. How many bars would one need to buy (and unwrap) just to have a seizable chance of finding one of the tickets? Most likely a lot. After doing the maths, I would estimate the number of chocolate bars that Mr. Salt had to buy to something between 12 and 40 million chocolate bars; which means this promotional campaign was most certainly one of the most profitable in history. Details below. This entry was posted in Litterature, Octave/Matlab, Probabilities on July 27, 2012 by Clément. The cereal box problem: How many boxes does it take to find all prizes? Modeling and measuring string comparison performance in C, C++, C# and Python.